Sara Hastings is an unmarried New York lawyer in her mid-thirties, much too busy to get involved in any romance. Her Aunt Martha has decided to take matters into her own hands and find her a husband. Unfortunately, Aunt Martha's method of doing it amounts to having the prospective groom bopped over the head and brought to Sara's apartment. Aunt Martha's choice is Brandon Cates, a young man who handles her finances. Although Brandon is already engaged to be married, this does not deter Aunt Martha. 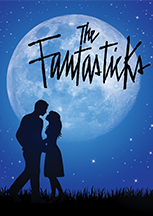 The Fantasticks is a funny and romantic musical about a boy, a girl, two fathers and a wall. The narrator, El Gallo, originally played by Jerry Orbach, asks the audience to use their imagination and follow him into a world of moonlight and magic. The boy and the girl fall in love, grow apart, and finally find their way back to each other after realizing the truth in El Gallo's words that "without a hurt, the heart is hollow". The famous score, which includes the classics Try To Remember, They Were You and Soon It's Gonna Rain, is as timeless as the story itself.